MACOMB/MOLINE, IL – Western Illinois University's Promise Plus, which is part of the state's "AIM HIGH" funding program, goes a step beyond other schools' "promise" programs. Western's Promise Plus not only significantly reduces or offsets tuition and fees,, but also other costs – room, meal plan, books and course materials – for new freshmen enrolling in Fall 2019. 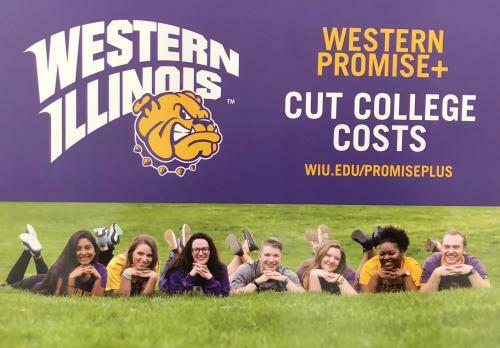 Illinois students with a minimum of a 1060 SAT or 21 ACT and a 2.75 high school GPA on a 4.0 scale are considered for WIU's Promise Plus program. The state of Illinois recently launched its "AIM HIGH" initiative, which is designed to provide tuition and fee incentives from Illinois public institutions to keep college students in their home state. "The Promise Plus program is another example of the University's commitment to our students," said WIU President Jack Thomas. "Western's Promise Plus program combined with our cost guarantee, which locks in tuition, fees, room and meal plan, provides an affordable education at a university that feels like home." For more information or to apply, visit wiu.edu/promiseplus.